When getting ready to sell your home, it is always a good idea to try to see your home as a buyer would see it. This is where having your home staged may be worth considering. Whether it be decluttering, ramping up your curb appeal or adding some beautiful potted plants to the porch, all will help with setting the stage to getting your home sold quickly and for top dollar. 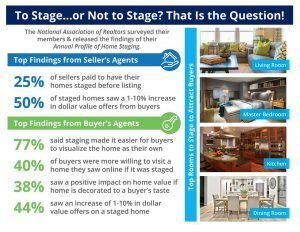 Click on the link to read these interesting staging stats and call your Realtor for more great tips on getting your home sold today!